Except as otherwise noted, the information and/or software within and available through this website are the exclusive property of RDS or its licensors. All website design elements, text, logo, icons, the presentation, selection and arrangement thereof, are Copyright © 2011-2018, RockDove Solutions, Inc.
(RDS and InCaseofCrisis.com) 970 Lake Carillon Drive, Suite 300, St. Petersburg, FL 33716 ALL RIGHTS RESERVED. Other than as otherwise described herein, they may not be copied, reproduced, modified, published, uploaded, downloaded, posted, transmitted, or distributed in any way, without RDS's prior written permission. Except as expressly provided herein, RDS grants no express or implied rights to you under any patents, copyrights, trademarks, trade names, or trade secret information. If you would like to reproduce or distribute any of the Materials you find on our site in any manner other than that described in this agreement, please contact RDS at 1-800-787-1639. 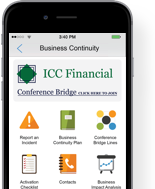 To use the In Case of Crisis Software, you must have a mobile device that is compatible with In Case of Crisis service and software. RDS does not warrant that In Case of Crisis service and software will be compatible with your mobile device.